Size 8' through 14' are normal projection 7' awnings. Pictured here A pair of wings with swaged poles are available as an option on the order page. The customer must supply (conduit tubing) to slide thru the pocket at the bottom of the wing. The awning must either brace off the vehicle side (mounting provided) for support or anchor with two 40 lb weights if used in the 'carport' (legs vertical) position. Customer must supply necessary load straps to connect the weights to the awning & accessories. Note: Most commercial flea markets have requirements regarding how to anchor tents, the 40# weight is a common standard. 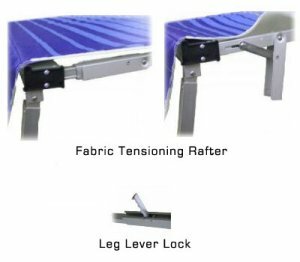 With the weights, using common load straps, the awning should be stable in commonly encountered windy conditions, with Thunderstorms, there are no guarantees. All replacement parts are available in the event of weather caused damage. (By comparison, once you damage the frame on an EZ up tent, the whole thing is unusable.) The fabric is heavy duty and easy to clean even if torn by a sharp object can be repaired by the factory or a canvas shop. 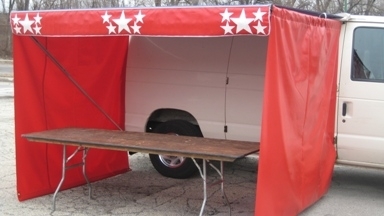 The design of the awning permits the valance to be used as a sign, or replaced with an event sign of your choosing.